KISSIMMEE – Valencia College trustees today signed off on terms of a lease agreement that would allow the college to rent an Osceola County building that gun manufacturer Colt had planned to occupy. The college plans to use the Kissimmee facility to house an Advanced Manufacturing Education and Training Center, which will train currently unemployed and underemployed workers, veterans, women and those who want to pursue a career in advanced manufacturing. Valencia’s trustees voted unanimously to approve the lease deal. Under the agreement, Valencia will lease the facility for seven years, with an option to extend the agreement for another three years. According to the lease agreement, Valencia will pay Osceola County $7,557.92 for the first 44 months, and $8,932 a month for the remaining 44 months of the lease deal. Valencia College will lease the former Colt facility in Kissimmee to house its new Advanced Manufacturing Education and Training Center. 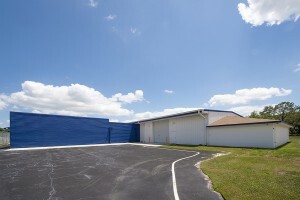 The facility is located near Florida’s Turnpike and U.S. Highway 192, close to the site of UCF’s planned Florida Advanced Manufacturing Research Center. A number of Central Florida employers – including Lockheed Martin, Mitsubishi Hitachi Power Systems, Hernon Manufacturing, Collins Manufacturing and Regal Marine – need skilled manufacturing workers. And as a wave of skilled workers retires, there’s a growing demand to replace them. There are currently more than 5,000 job openings for skilled workers, according to the Manufacturers Association of Florida. But because there aren’t enough skilled workers to fill the positions, the state’s 17,000 manufacturers – who make everything from electronics to medical devices – often spend months looking for qualified candidates to fill open positions. Valencia began training workers for advanced manufacturing three years ago, when the federal government awarded $15 million to a consortium of Florida community colleges to train veterans and unemployed residents for high-skill manufacturing jobs. Last year, Valencia won a $2.5 million federal grant to focus on recruiting the unemployed, veterans and women for skilled jobs in Florida’s manufacturing industry. Valencia’s “M-Path” initiative gives students a chance to earn industry certifications, college-level technical certificates and degrees in key areas of need in the state’s manufacturing sector. Among the nationally recognized industry certifications that will be available include Computer Numerical Control, Quality Control and Inspection, Mechatronics (mechanics, electronics and automation involving computer interface), Welding Technology and Assembly (the use of tools and processes) and a short-term Advanced Manufacturing Specialist Certificate (AMSC).